15U Youth Teams from Chinese Taipei, Korea and 2 Japanese Teams, one National and the other representing Matsuyama City played Asia Challenge Match 2013 in Matsuyama for 3 days from November 23 to 25, 2013, hosted jointly by Japan Amateur Baseball Association (JABA), the Yomiuri and Tokyo Yomiuri Giants, in cooperation with the City of Matsuya. The games of Japan vs. Korea on Sunday, and Japan vs. Chinese Taipei were televised. The 15 U Japanese National team won all the 3 games. Manager Yoshitaka Katori of Japanese National Team praised high level of his players with good potentials for the future. 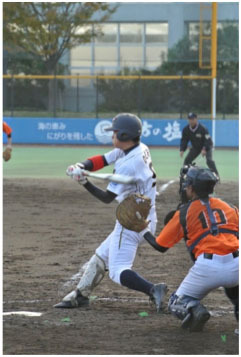 Yasuhiro Ochi from Kobe was awarded MVP and Captain Yamamoto of Team Matsuyama　as the letter-winner. The 3 day event also served as scorers’ clinic led by an IBAF official scorer, Takuya Sumi of JABA, in preparation for the 2014 WSBC Women’s World Cup in Miyazaki.